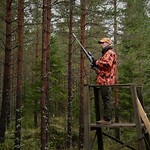 British pro stalker Paul Childerley is after the whitetail deer in the Finnish forests. He is visiting the Sako factory with Sporting Shooter editor Dom Holtam, to look at new rifles and ammunition, and to try them out on a driven hunt. Meanwhile, Roy is keen to try out lead-free bullets on deer and foxes. He gets to test them on a fox, and then digs out the round to see how it performs. There’s news, there’s Hunting YouTube and Charlie is in a Father Christmas hat. It’s the new episode of #FieldsportsBritain – ho, ho, ho! It Got Western | 14 Man Limit!